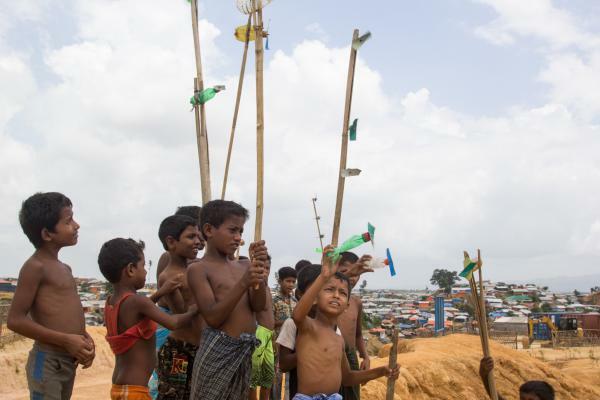 In the Balukhali refugee camp, boys between the ages of seven and 11 play with forfori, homemade toy airplanes. 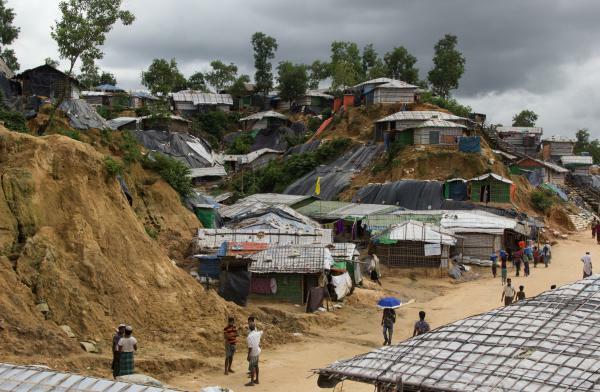 Tarps and refugee shelters cover steep hillsides in the Balukhali refugee camp in Bangladesh. Many of the sandy slopes have collapsed in the monsoon rains. Kids in the Balukhali Rohingya refugee camp try to get the propellers on their homemade toy airplanes to spin as fast as possible. A girl picks a flower from the roof of a shelter in the Kutupalong Rohingya refugee camp in Bangladesh. The flower had sprouted from a sandbag used to weigh down the plastic and bamboo roof. A day after moving into a newly built shelter on the edge of what is now the largest refugee camp in the world, Mohammed Salaam opened up a small shop selling snacks, betel nut and soft drinks. 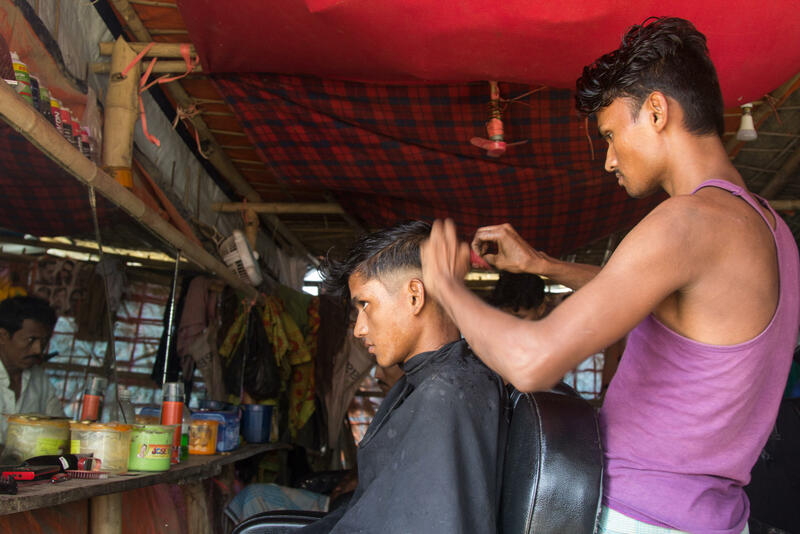 In the Balukhali 2 refugee camp, three young men have set up a barbershop under a tarp. They picked up their barber skills by trimming each other's hair when they couldn't afford a professional cut. A fact-finding mission from the United Nations Human Rights Council labeled last year's attacks against Rohingya Muslims "crimes against humanity" and called for top military officials in Myanmar to be prosecuted for genocide. Its report found that Myanmar troops attacked hundreds of Rohingya villages, killed thousands of people, torched homes and systematically raped women and girls. "Rapes were often in public spaces and in front of families and the community, maximizing humiliation and trauma," the report states. "Mothers were gang raped in front of young children, who were severely injured and in some instances killed." The attacks by Myanmar soldiers spurred more than 700,000 Rohingya to flee across the border into Bangladesh. According to the U.N., it was the fastest human displacement since the Rwandan genocide of 1994. One year later, those hundreds of thousands of Rohingya refugees remain stuck in sprawling, makeshift camps in Bangladesh. The conditions have improved somewhat over the last year — there are more water wells, pit latrines and drainage ditches — but the camps remain overcrowded and at risk of landslides, especially in the monsoon season. UNICEF estimates that more than half the Rohingya refugees are children. 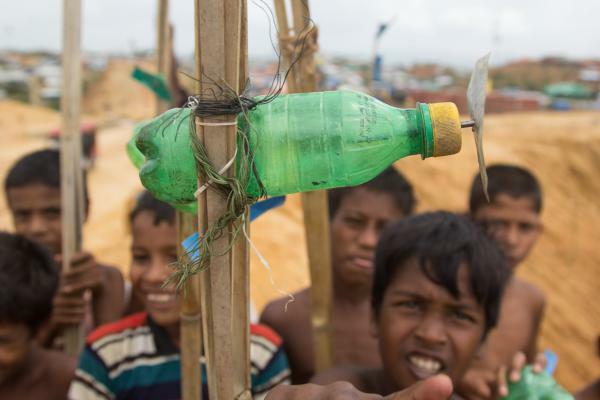 On a hillside in the Balukhali camp, two dozen boys have climbed to the highest point on a sandy ridge to fly homemade toy airplanes called forfori, "fan" in the Rohingya language. Each toy is made from a plastic soda bottle with a small strip of metal stuck to the cap as a propeller. Some are strapped onto sticks of bamboo so the boys can thrust them higher into the winds that sweep across the camps. Umar Farooq, who's 11 years old, says he and his friends also used to make forfori back in Myanmar. "The most important part is the zinc," he says, referring to the propeller. Farooq is one of the older boys. The youngest of the group says he's seven. They maneuver their toys in the air, trying to get the propellers spinning as fast as possible. There's a word in Rohingya — afándhi — that means children roaming around, not doing anything of importance. Parents worry that conditions in the camps could amplify this. And international aid groups have warned that the refugee children could become a lost generation. Farooq and his friends, however, say they keep themselves very busy. They tick off all the things they do each day — playing forfori and soccer, collecting firewood, studying. But the reality is that most refugee kids are not attending school regularly — or as much as international aid agencies say they should. 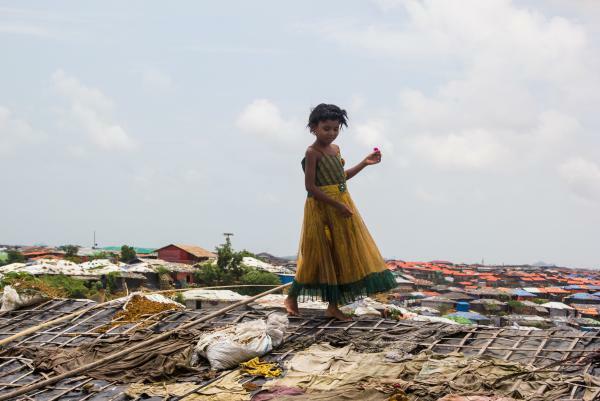 Bangladeshi officials have resisted allowing charities to set up formal schools in the camps, fearing that such amenities will encourage the refugees to stay. Instead of schools, aid groups have opened "learning centers" and "child-friendly spaces," where kids go for about two hours a day. Farooq says proudly that he goes six days a week. Keeping busy in the camps can still be a challenge for adults. The Rohingya technically are not allowed to work in Bangladesh. Each family receives bi-monthly rations of rice, lentils and cooking oil from the U.N. World Food Program. The camps are so crowded that there's no room to grow crops, but some of the Rohingya fish in nearby rivers. Some men are able to get a few days' work clearing drainage ditches or carrying goods into areas of the camps that are accessible only by foot. Women and girls often collect firewood to sell. Despite the restrictions on working, suppressing the entrepreneurial streak of many refugees is apparently impossible. Recently, more and more of them have been setting up small businesses. Simple outdoor markets have emerged along the main paths through the camps. Residents sit behind piles of vegetables and spices that they're offering for sale. But there are also more formal businesses — small tea shops and stalls where young men charge cell phones from a solar panel. Some vendors even occasionally sell phones, ranging from the cheapest Nokias to high-end Android smartphones. The devices are a way to stay connected via Facebook and WhatsApp throughout the sprawling camps. In the Balukhali 2 camp, Eliyas Mohammed has set up two long mirrors under a tarp to create a barbershop. Along with two of his friends, he trims hair for roughly 40 cents a cut. "When we got here, we didn't have any work," he says. "At that time, we just got rice, oil, lentils, and we thought, 'How can we survive here?' We decided it would be better to start this shop to make some money to support our families." When they opened the barbershop at the end of 2017, he says there were few customers because hardly any Rohingya had money. But in a sign of how the camp economy has grown, Mohammed says that's slowly changed. On a good day, he might get a dozen customers and can take home $4 or $5. This, he says, allows his family to eat more than just the basic international food rations. And, he adds, running the shop gives him something to do. (SOUNDBITE OF TYCHO'S "AWAKE") Transcript provided by NPR, Copyright NPR.